Whilst I’m not frugal (or remotely good with money for that matter…) I definitely shop with CPW in mind. CPW - to the uninitiated - is w*nky fashion editor speak for ‘cost per wear’ aka. the cost of a garment vs how many times it sees the light of day. I live in a bedsit (in case you are labouring under the misapprehension that my life is glamourous…), with zero space for surplus clothing - hence why my local charity shop, friends, housemates and sister receive regular sartorial handouts. So the concept of buying a dress designated for the races or a wedding, only to be resigned to the back of my closet post-event is alien to me. That’s not to say I don’t have a handful of smartish dresses – I just choose styles that offer mileage past the main event. With this mantra in mind, here’s nine lovely dresses that will look equally at home (with the addition of a smart jacket and closed toe shoe) in the office as they do in the church pews. CPW FTW! 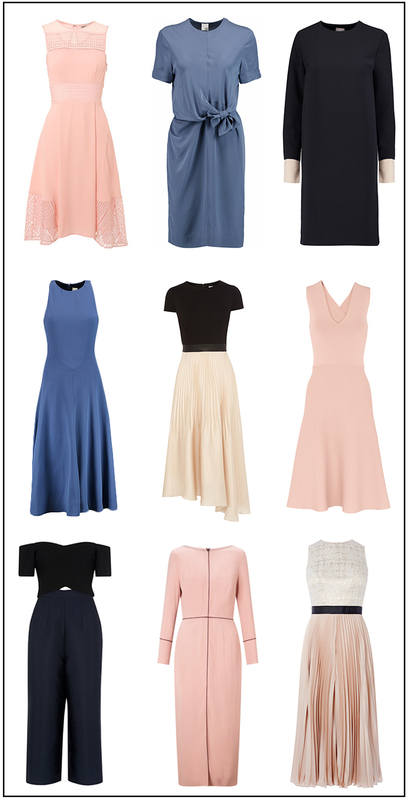 Top row from L - R: Maisie blush pink dress, Whistles. Daniella tie front dress, Iris and Ink. Margot two tone mini dress, Iris and Ink. Middle row from L-R: Terri blue crepe dress, Iris and Ink. Colour block Toola dress, Coast. Cross back fit and flare dress, Whistles. Bottom row L-R: Marina cross back jumpsuit, Whistles. The Connaught column dress, The Fold. Bolina jacquard jumpsuit, Coast. Flatforms from L-R: DKNY Trainers, Daniel Footwear. Ash Snakeskin Trainers, Grazia Shop. Gold glitter flatforms, Office. 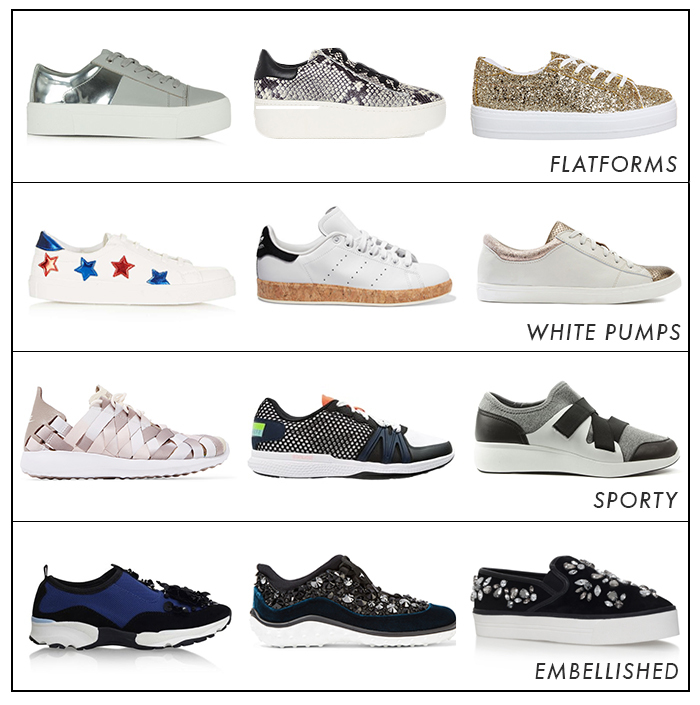 White pumps from L-R: Copenhagen star trainers, Topshop. Cork-trimmed Stan Smiths, Net-a-porter.com. Metallic leather trainers, Next. Sporty from L-R: Nike woven, Net-a-porter.com. Stella Sport, Zalando. DKNY trainers, Daniel Footwear. Embellished: Carvela Lullaby flats, House of Fraser. Miu Miu crystal embellished, Net-a-porter.com. Carvela embellished slip-ons, House of Fraser. Behind the smoke and mirrors of blogging; when photographer Natasha and I shot this post the weather was overcast and less than summer-like and we were in a hurry to catch the last glimpses of day light after a long Tuesday in the office. It all goes to show what a great camera lens and a touch of post- editing can do, it's refreshing to be honest sometimes and share the truth behind the mechanics of blogging!